Starting with some photos (all by Michael Stadler) of work I’ve done in recent times. 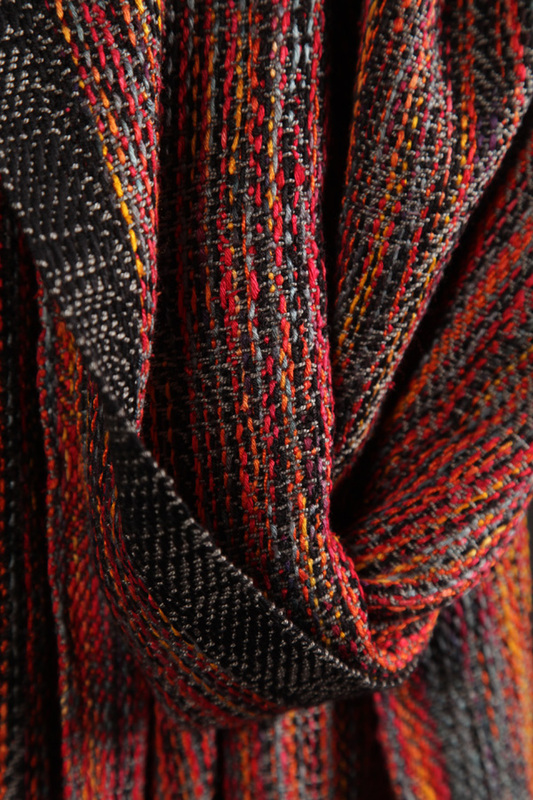 These are unusual (in the weaving world) views of handwoven pieces, which is what we’ve been aiming for. 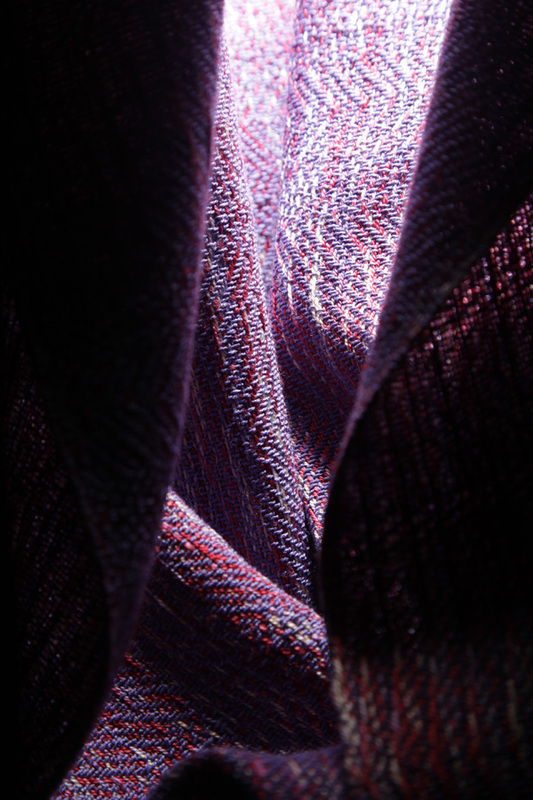 The idea is to show in two dimensions the character of the fabric (which is three dimensional). What do you think? Does it work? 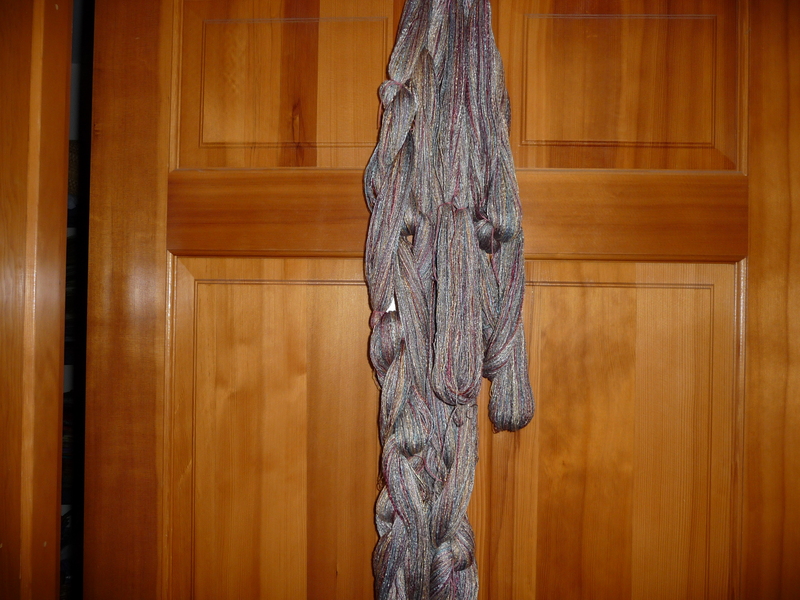 Those two are from the Lava Flow series — large shawls, of shimmery yarns. 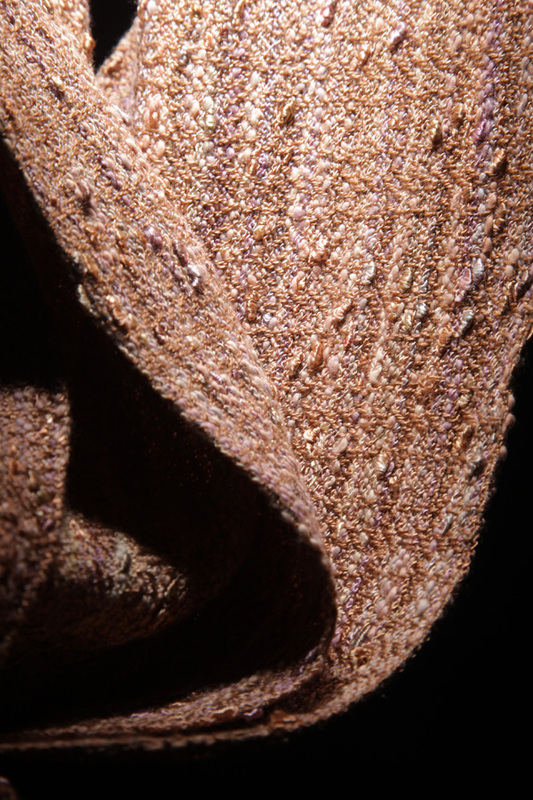 Below is an intimate view of the two Berries and Cream shawls, both of hand-dyed rayon and tencel. They’re light and airy. 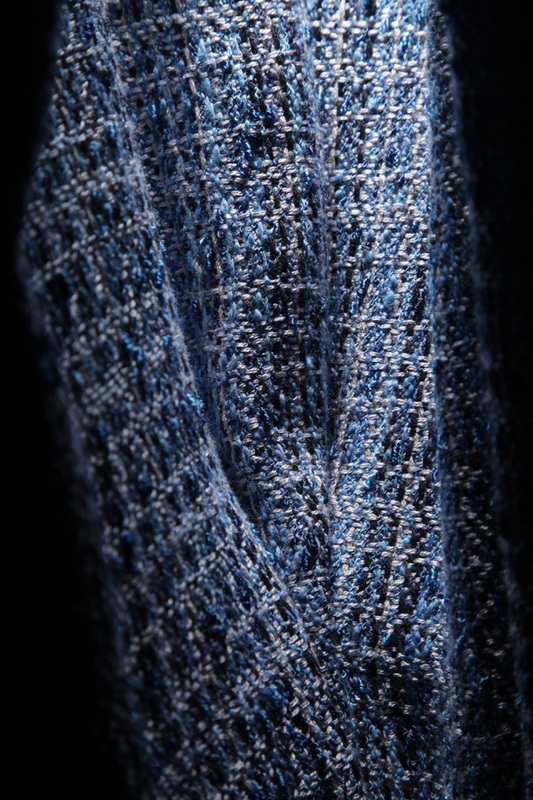 And finally, Indigo Bunting, a large, highly textured shawl that drapes and swings most satisfactorily. Now here’s the “undone” part — the warp chain for the next series of scarves to be woven on Sally, already named the “Precious Metals” series. 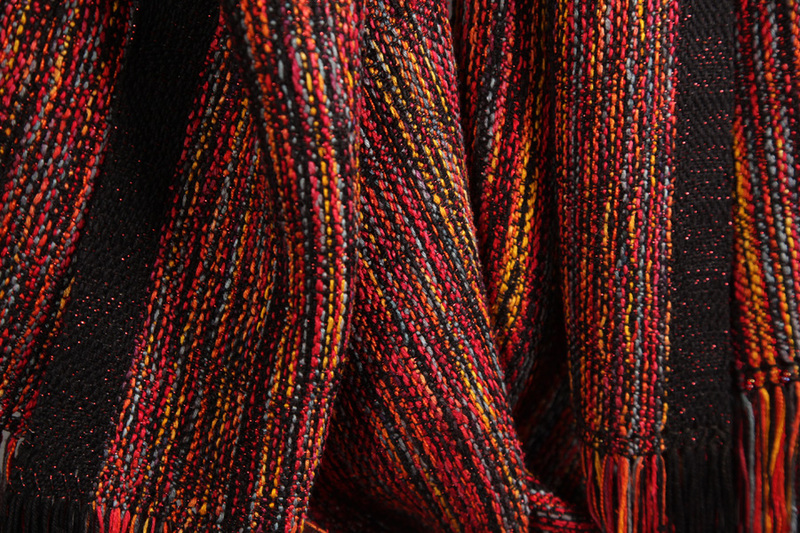 There will be four of them, they’ll be exceptionally lustrous because this warp is 100% hand-dyed rayon, and all the weft yarns will be tencel. You make such lovely pieces, Anne. The photos work for me! i want to hold them all in my hands and feel the softness and lovely textures for myself. Yummy! These photos are simply stunning …I can feel the softness and textures… You have done a beautiful job on these Annie! Yikers. Those are gorgeous. The photos may or may not do them justice, but they don’t need to. They look terrific. Wow, wow, and wow! Your pictures are stunning. The light, folds, textures give them such depth of character and lovliness. I wish I could just fold them around myself! 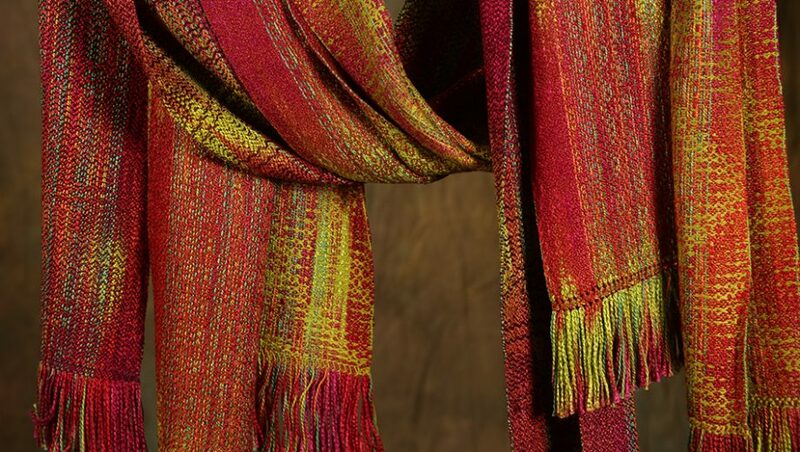 Berries and Cream, Salt Water Taffy….humungous depth of light which highlights the gorgeous character of the colors and the weave! Wish I could pop by to see them! But, I am on the east coast, and you are on the west! The pictures at least give me a great idea of what you have been doing. Indigo Bunting….glorious. The last picture showing the warp for the Precious Metals series shows great finess of color with the sleekness of tencel. Hurry up with making them. Final products will be quite breathtaking! Carry on yYu certainly have tons of imagination and willingness to defy the norm! Oh my — those are all so very beautiful!